Last Saturday, we went to our hometown of Waynesboro, MS to the Whistle Stop Festival that Granny Nan helped coordinate. Addison had a great time. Her favorite thing though was the Wayne County High Show Choir. She got off to the side and danced her heart out and tried to make every motion the girls did. She did a pretty good job! She also got to try her very first Cooley burger and loved it. 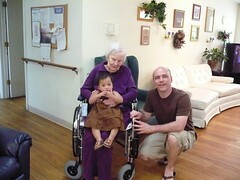 Our day ended with a visit to see Addison's great grandmother who is 91 and lives at a local nursing home. We went around 4:00 p.m. and it was already bedtime so we didn't stay long. Surprisingly, Addison wanted to sit in great grandmother's lap immediately. We're so glad we were able to get these pictures.